I've been working on two separate patterns for ponchos using the Lacy Trellis pattern but the math is being elusive and annoying. To take a break, I decided to work on something I promised a friend a very long time ago: her very own blanket. She told me that she had very specific colors in mind: vintage farmhouse colors. I have no idea what that means, but to her that means avocado green, pumpkin orange, mustard yellow, turquoise, and cherry red. She left the design to me but told me that she really likes granny squares and ripple blankets. I decided to go with a hybrid pattern. 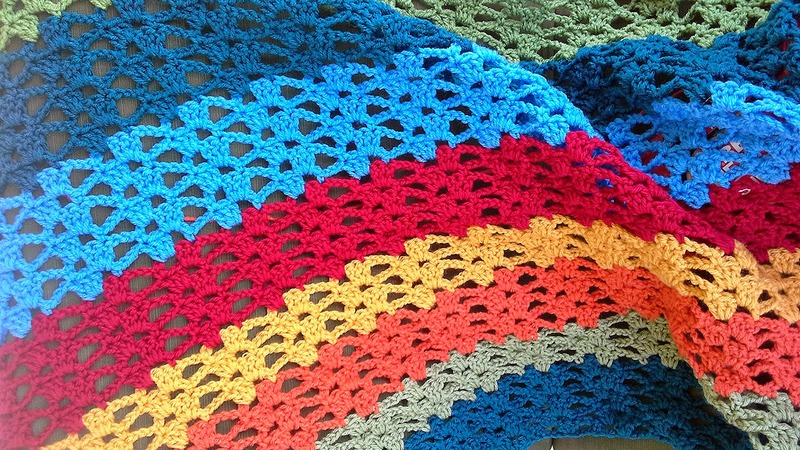 It's a Lacy Trellis blanket. In reality, the colors are deeper than what this picture shows. 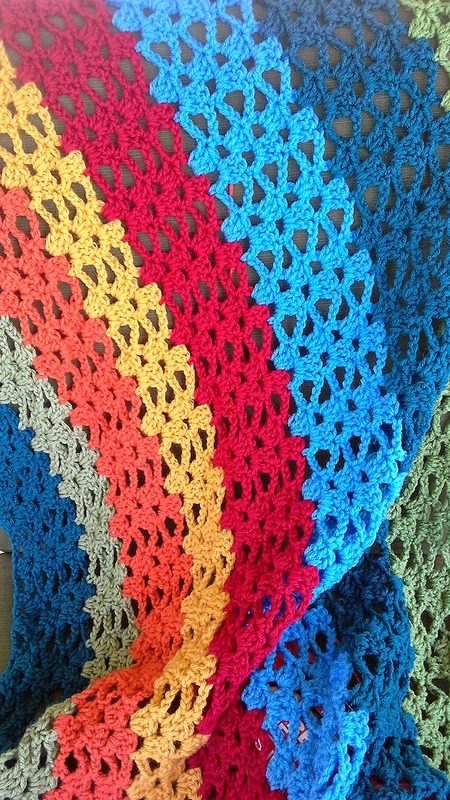 I'm debating whether to keep going in a rainbow pattern or to get a little crazy and mix it up a bit. I think everyone has a pattern they love, a pattern that gives them lots of pleasure. This pattern is the one for me. Maybe it is the chain between the granny clusters that gives the extra space and makes the rows fly by. I don't know. It just makes me so very happy! I'm about 35 or so rows in with about triple that left to go. I'll post when it is all done! I'm in love with this! Do you have a pattern? Nevermind! Just saw that you posted it separately :) Thanks for sharing!